Becoming is superior to being. Without the knowing of divinity by man can deity survive? We, the Gods, wish to learn from you humans in your quest for truth. Let Us make the human being in our own image and likeness. The notion that divinity is outside the human being makes people feel free to brutalise the human person/being. Shva’s trident symbolises humankind as the divinity, the temple and the worshipper. Human experience, integrating the abstract and the concrete, is distilled and assimilated by God, who has no experience of material conditions, and contributes to her development. The distillation of human experience, which represents the interaction of the abstractions represented by possibilities with the concrete realities of actual experience in a material framework, is assimilated by God and contributes to the development of God. Man makes God in Yoruba thought. It is through human actions that the divine sparks that fell to earth when the vessels enclosing the spheres were shattered under the force of divine light at creation are liberated from their material casings and enabled to rise to their divine sphere, thereby facilitating the creation of cosmic unity. These processes shape the tapestry of the universe as it is woven by That which some refer to as chance, others as the force that makes existence possible, some as Ultimate Being. Some see this Enabler as the relationship between chance and possibility. This Relationship enables the human being to participate in the structuring of individual and social existence. It also enables human involvement with the metaphysical relationships that make individual and social activity possible. Human individual and social activity, in turn, make possible the actualisation of particular metaphysical relations. The engagement in individual and social existence and their metaphysical relationships enables the human being to operate as an active agent in constituting the ground of being. The actualisation of the ground of being through human action is an ontological activity that complements the nature of this Ground as constitutive of existence. In this aspect of its character, it predates and is independent of humanity. The ground of being can be understood, therefore, to be both constituted by and constitutive of existence. The processes represented by these numbers constitute the warp and weft of the cosmos. They represent the processes through which the material structure of the universe is constituted. Within this material structure, and made possible by it, life and consciousness as they are conventionally visible, are realised. Within the encounter of mind and cosmos, the universe is resolved into the basic activities of attraction and repulsion, transformation and conservation. The orbits of the circles of Kuntunkantan emerge as the forces that enable existence across microcosmic and macrocosmic scales, from the invisible world of the atom to the unseen universe of the farthest galaxies, and the speculative existence of unknown universes. The circles of Adinkrahene are held in orbit around the star shaped nucleus by the force that attracts them towards the centre of the symphony of circles but, which, rather than impel them into the nucleus, keeps them spinning around that centre in perfect symmetry. Why do the planets and the stars not collide with each other? Why is the sun close enough to the earth to nourish life and provide light and yet is sufficiently distant not to scorch the earth? The motions of the three black and the three white rings around the centre of Adinkrahene represent the configurations, the forces and processes, through which the universe is brought into being and sustained. These configurations are embodied by six numbers. These numbers are represented by the six circles of Adinkrahene. Two of these numbers relate to the basic forces; two fix the size and overall ‘texture’ of our universe and determine whether it will continue for ever; and two more fix the properties of space itself. The central circle is Q, which determines the fabric of the universe. It represents the ratio of two fundamental energies and is about 1/1000,000 in value. If Q were even smaller, the universe would be inert and structureless; if Q were much larger, it would be a violent place, in which no stars or solar systems could survive, dominated by vast black holes. The second circle is N, which makes possible the vastness of the cosmos. It measures the strength of the electrical forces that hold atoms together, divided by the force of gravity between them. N is equal to 1,000,000,000,000,000,000,000,000,000,000,000,000.If N had a few less zeros, only a short lived miniature universe could exist: no creatures could grow larger than insects, and there would be no time for evolution. The fifth circle is ε , whose value is 0.007, defines how firmly atomic nuclei bind together and how all the atoms on Earth were made. Its value controls the power from the Sun and, more sensitively, how stars transmute hydrogen into all the atoms on the periodic table. Carbon and hydrogen are common, whereas gold and uranium are rare, because of what happens in the stars. If E were 0.006 or 0.008, we could not exist. The third circle is Ω , the cosmic number(omega),which measures the amount of material in our universe-galaxies, diffuse gas, and ‘dark matter.’ Ω tells us the relative importance of gravity and expansion energy in the universe. If this ratio were too high relative to a particular ‘critical’ value, the universe would have collapsed long ago; had it been too low, no galaxies or stars would have formed. The initial expansion speed seems to have been finely tuned. The fourth circle is λ , (lambda),which represents a cosmic ‘antigravity’ that controls the expansion of the universe-even though it has no discernible effect on scales less than a billion light-years. It is destined to become ever more dominant over gravity and other forces as our universe becomes ever darker and emptier. Fortunately, λ is very small. Otherwise its effects would have stopped galaxies and stars from forming, and cosmic evolution would have been stifled before it could even begin. The sixth, outermost circle is D, which represents the number of spatial dimensions in our world. D equals three. Life couldn’t exist if D were two or four. Time is a fourth dimension, but distinctively different from the others in that it has an inbuilt arrow-we ‘move’ only towards the future. Near black holes, space is so warped that light moves in circles, and time can stand still. Furthermore, close to the time of the Big Bang, and also on microscopic scales, space may reveal its deepest underlying structure of all; the vibrations and harmonies of objects called ‘superstrings’, in a ten-dimensional arena. These six numbers play a crucial and distinctive role in our universe, and together they determine how the universe evolves and what its internal potentialities are. We could only have emerged in a universe with the ‘right’ combination. It is astonishing that an expanding universe, whose starting point is so ‘simple’ that it can be specified by just a few numbers, can evolve, with the suitable tuning of these numbers, into our intricately structured cosmos. Adaptation of Martin Rees’s Just Six Numbers. The immediately preceding paragraph, the descriptions of the six numbers and the summative paragraph on their significance at the end of their descriptions are adapted practically verbatim from Martin Rees’s Just Six Numbers. This book is wonderful in demonstrating both the sense of insight of a magus and the wonder of a child. Adinkrahene represents the vortex of energies which have created, sustain and transform the cosmos. A concatenation of forces. A shuttle on which is spun the beginning, the transformation and the perpetuation ofexistence. A weaver-bird alive with actual and potential forms and designs. Its symphony of black and white circles gives it a sense of motion that suggests the actualisation of latent forms, the release of hidden energies. Its two dimensionality extends into a background which the mind enters into to enact its own designs through the stimulating agency of Adinkrahene, realizing the nature of Adinkrahene as a shrine formed by the intersection of shape and mind, where creative energies ferment, a kernel, a phallus of creative mysteries, available when the doors are opened by the questing mind. We are sitting with Martin Rees in the Master’s Lodge at Trinity College, Cambridge, where he is Master of the College. In the elegant walls of this structure, within the grounds where Isaac Newton walked as he pondered those ideas that have been fundamental in unravelling the forces that shape the character of the universe, we talk about the structure and dynamics of the cosmos. He describes the symphony of numbers through which the universe makes meaning. He presents this knowledge to us in the language of an astronomer. We interpret it in terms of our enthusiasm for Adinkra, in terms of our effort to perceive the universe through Adinkra, the mountain top, the unifying depth, from which we see the universe, a shape that constitutes an intersection of mind and matter in which the cosmos is subsumed. We share with Rees his wonder and delight in uncommon but delicious knowledge gleaned from a lifetime of adventures on the space that embraces the vastness of the cosmic ocean and the depths of the subatomic world, at whose edges we stand with him, surveying the magnificent panorama of worlds seen and unseen. He marvels at the fact that the human race has evolved from a concourse of matter strewn from the stars to become beings complex enough to contemplate existence. We participate in both the knowledge of the magus and the wonder of the child. We share his gasping with delight at the fact that, to adapt the words of astronomer Alan Dressler, we possess the marvellous ability to comprehend aspects of this magnificent symphony. Adinkra is the understanding distilled through experience and carried from the arena of this world to the world beyond through the transition of death. It embodies the seeds carried in the self that never dies when that self passes through the death of the body to its fellows in the world where death is transcended. It is the contribution of the self to the community of those on earth and the share of the self in the Greater Whole that encapsulates all. The Greater Whole that is both Outside and Inside, cosmic and terrestrial, celestial and subatomic, within and beyond time, human and nonhuman, material and nonmaterial. How else will the Greater Whole grow but through the fruits of knowledge brought to It by Its children? Those fruits, the contribution of the human being to the growth of the cosmos, are Adinkra. Those who come after in the march of existence will then be imprinted with, their journeys influenced by, their path made smoother, by the harvest of experience made possible for them by those who have come before. Adinkra, a link between past and present, between present and future, between life on earth and life beyond death. A link between this world and life beyond this world. Adaptation of outline of cosmic evolution from Dion Fortune’s Cosmic Doctrine. Two things fill the mind with ever new and ever increasing admiration and awe, the more often and the more steadily they are reflected upon, the starry heavens above me and the world which I am. Like Immanuel Kant, who speaks in the lines above, we can travel the world within us and the cosmos without us without moving from one spot. A key vehicle in this navigation of inner and outer space is the evocative power of Adinkrahene. Kant never travelled far from Koningsberg, but united the universe within him and the universe outside him as he surveyed both far ranging worlds of thought and distant universes of vision. Within the circles of Adinkrahene are symbolised both the cosmos and the human being who created Adinkrahene as a representation of that cosmos. Adinkrahene embodies the known and the knower, that which is known and the one who knows, thinker and thought, the cosmos and that within the cosmos which contemplates the cosmos through the symbolism of Adinkrahene. 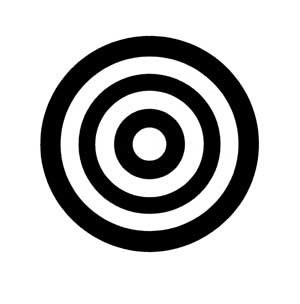 The structure of Adinkrahene can be understood as three black circles or as six black and white circles. If understood as three circles, the first, outermost circle of Adinkrahene is the starry heavens, the celestial world, in their revolutions through space and time. The circle after the outermost one is the human person, who reflects on the cosmic world and on the relationships between the cosmos and themselves as an individual and as a representative of the earth. The third circle is the conjunction of mind and cosmos represented by the recognition of and reflection on the fact of being, the sensitivity to self and environment that is consciousness that emerges through the convergence of terrestrial and extraterrestrial matter in shaping that self that now looks out upon the cosmos. The innermost circle could also represent the body, the next circle the mind, and the outermost and largest circle the spirit. Adapted from Immanuel Kant, Critique of Practical Reason. Adinkra are visual symbols first created by artists from the Akan nation,which is now part of Ghana and,perhaps,also,by Gyaman artists,who are now part of Ivory Coast.This blog is a personal response to the power of these symbols.The blog is inspired by the evocative force of the Adinkra symbol known as Adinkrahen whose power emerges from its constellation of circles moving in silent majesty round a central point.Like most Adinkra symbols,it is both simple and pregnant.